The emerging economies of the BRICS countries are proactively promoting mutual trade in their national currencies, a trend that could reduce the dominance of the US dollar in global trade. The BRICS, the group of five major emerging economies of Brazil, Russia, India, China and South Africa, grouping is actively engaged in speeding up the process of increasing their mutual trade in national currencies. The process virtually kicked off last July at the BRICS summit in Forteleza (Brazil) as BRICS leaders signed an agreement to establish the $100 billion BRICS New Development Bank and a reserve currency pool worth over another $100 billion. They claimed that the New Development Bank will help the BRICS member-countries to avoid the adverse effect of dominance of the US dollar, and the dollar-backed IMF and the World Bank in the world trade. In March 2013, in an initiative to promote mutual trade in national currencies, the BRICS countries signed two agreements to provide line of credit to business community and decided to examine the possibility of setting up a development bank on lines of multilateral lending agencies. In accordance with the agreements, recently they started to gradually shift to the use of national currencies with negotiations between the member-countries to bring more and more sectors of their economies under the local currencies in mutual trade and investments. According to experts, the return of BRICS to the use of national currencies in their trade and investments has an obvious advantage that the business people will not have to hedge against two different currencies: For example, in Indo-Russian trade between rupee and dollar and then dollar to rouble, and vice versa. Certainly, if one currency is cut out, transactions costs are lower and mutual trade becomes more competitive. Secondly, the move by the BRICS to trade in each other’s currency will further pluralise the limited number of trading currencies and lessen the use of dollar. Today the total trade between the BRICS countries is $6.14 trillion (about 17 percent of the world’s total trade). Thirdly, the global trade is currently dominated by the dollar, which often results in the volatility of a particular currency in the currency market in the developing countries, causing huge economic and trade losses. The BRICS’ transition to trade in national currencies will protect them from adverse fluctuations of the local currencies in the member-countries of the group. Therefore, faced with the uncertain prospects of currency volatility, BRICS countries are actively working out mechanisms between them to carry out mutual trade in their national currencies. Undoubtedly, this process of returning to national currencies in trade within BRICS is led, first of all, by China, Russia and India. “Both India and Russia are of the view that transactions in national currencies would be mutually beneficial for our national economic cooperation. Our two Central Banks are working on modalities and are expected to make concrete recommendations to our governments shortly,” India’s ambassador to Moscow P.S. Raghavan told RIA Novosti news agency on February 18. 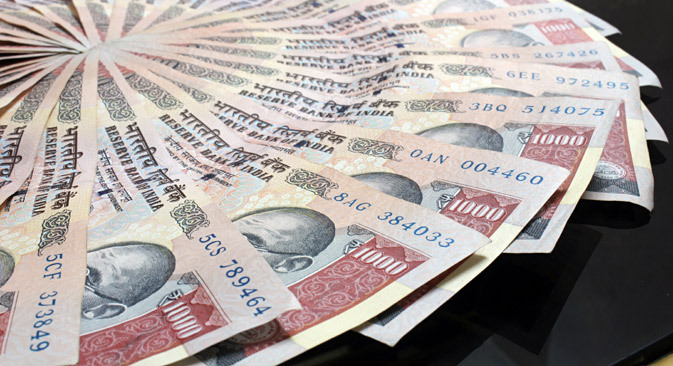 India and Russia have set up a Joint Working Group (JWG) to work out an “appropriate mechanism” for rupee-rouble trade. The JWG, with representatives from the central banks, export-import banks, commercial banks and governments of both the countries, have conducted a number of sessions since last October on this mechanism. The trade turnover between the two countries is expected to immensely increase after this mechanism is put in place. The dollar-dominated trade between the two countries stood at $11 billion, in 2014. The Indo-Russian trade, till the collapse of the Soviet Union, was based on rupee-rouble transactions, which had resulted in India emerging as the biggest trade partner of the former Soviet Union in the developing countries with two-way trade to the tune of $5 billion in 1991. The Indo-Russian initiative is important in view of the BRICS countries’ effort to avoid dollar-denominated trade. Russian President Vladimir Putin said last year in December in New Delhi that the question of a transition to national currencies was very relevant. “This will be mutually beneficial for the two countries, especially in view of the start of deliveries of liquefied natural gas from Russia to India from 2017,” he said. Roy also said that the BRICS countries were keenly interested in reducing the use of the dollar, stressing that Russia and China were already settling accounts in national currencies for a number of their products. They have established a mechanism to settle their mutual trades in rouble and yuan. In this respect, China has moved beyond all of the BRICS countries. Russia is well-ahead in planning a transition to making trade settlements in rouble and yuan. “In the long-term, of course, settlements in rouble and yuan are very promising,” Putin said at the Asia-Pacific Economic Cooperation (APEC) summit, in November in Beijing. After his statement, Russia’s largest bank Sberbank began financing letters of credit in Chinese yuan and performed the first transactions in yuan with one of Russia’s largest companies. The two countries aim for a broader use of the yuan and the rouble in mutual settlements in different industries, including defence, telecoms, energy, and mining. Last year in March, Brazil signed a deal with China to trade in own currency to protect from dollar fluctuations. Likewise South Africa, too, has been trying to enter into bilateral agreements with other member-countries of the group as a step towards replacing the dollar as the main unit of mutual trade and investments. However, according to some experts, the BRICS’ transition to the use of national currencies in mutual trade and investment is very slow because the member-countries have not yet been able to develop a concrete mechanism for its implementation, within a definite time-frame. “The process is taking a long time and the delay in working out and implementing the mechanism on the ground may prove to be immensely disadvantageous for the emerging economies of the BRICS as a whole, especially in view of the looming recession over the world economy,” they claim.